Your FPV Goggles are what lets you actually become your drone. They allow you to jump inside and see things from a pilots perspective and are what makes drone flying so magical and addictive. With so many options out there choosing drone goggles suited exactly for your needs can be difficult. We've written indepth guide to help you get on top of things and send you in the right direction! Getting the right goggles for you will make a huge difference between your first flight being an unbelievable experience or just plain frustrating! Once we put on our fpv goggles we rely on them entirely to see where our drone is and control it accordingly, for this reason, it is important to have goggles that really pull you in and allow you to take in everything you need to see. If your goggles are not up to the job it could cause you to crash either into objects we can't see such as branches or we could simply lose our position in the sky and get lost! Anyway if that happens, and you need to start a new build - check our indepth guide on building a drone. For some people flying with goggles at first can be a strange and disorientating experience as you may feel so immersed that your brain can't quite co-ordinate what's going on right away! This is completely normal and the more you do it the quicker you will adjust your instincts and it will become second nature. I would suggest sitting down for your first few flights and having a friend around you so you feel safe and are unlikely to be surprised by anyone. When I started it felt difficult to focus on my goggles screens however this quickly started to feel more natural for me. Goggles are a very personal thing, your face, eyes and preferences are unique to you, with that in mind I'll try to cover everything you should look to consider when buying your first pair of goggles helping you to get it right the first time! For the best experience I strongly recommend you find a way to try as many goggles as you can either through a store, a friend or local club and find what works for you! Nothing can beat your opinion and preferences to help you decide what to spend your hard earned money on. Many of the points I'm about to cover can be subjective but should give you a great starting point! In this section, we are going to take a look at five sets of goggles across the full budget range and see how these all compare. For each set of goggles, we'll be giving them a mini review alongside some comparison tables. Detailed features you should be aware of when deciding on goggles are listed below this section. On upgraded model advancements are made on the sensitivity of built-in receiver. Now it's - 95dBm built-in model. The battery is also upgraded to 1600mAh (twice more larger) and there is OSD information provided about the current Vfreq & Vbat. These represent the cheapest goggles I could find and were actually the goggles I started flying with. They are very simple and have a low resolution but can do the job if you are restricted cash wise. These goggles have a low price point and sadly a low-resolution screen. They do however come with a built-in receiver and everything you need to start flying! If you are really tight on cash and want to get in the air you can make with the lower resolution and perhaps look to upgrade in the future when you are more into the hobby. For beginners or ride alongs I would happily recommend this option however would strongly suggest spending just that little but more on the VR-D2s. Eachine VR D2 Pro is the upgraded version of VR D2. The receiver is better. It's equipped with the power indicator function instead of the built-in buzzer, you can check the power on displayer directly. If you want a pair of goggles with a great screen and resolution and all the important features but aren't looking to spend a fortune these may be the ones for you. The only compromise you will have to make is that these are a larger box goggle. They may not be as comfortable or as practical as the FatSharks but at over $300 cheaper you would be more than happy to live with that. As some of the best box goggles available these have left many people asking why do they need to pay for Fat Sharks? They have a good size screen with a great resolution and feature diversity. The pro version now features built in DVR. A good beginner goggles is judged based on 3 factors- LCD display, included receiver and feel and fit on your face. Eachine EV800D ticks all the 3 boxes. Eachine launched the EV800D after the more successful EV800. The EV800D feels comfortable on face for prolonged usage. The LCD display included is a, 800x480 crisp LCD display is bright, which is a treat to look at. This goggle detaches and doubles back as a ground station which can be mounted on a tripod. Though DVR is a feature exclusive only to high end goggles costing $250+, Eachine decided to add DVR for a package that costs less than $100. The in-built battery lasts for an hour and fifteen minutes. The Fresnel lens placement is such that it does not cause any discomfort to the eye during long usages. This goggle can accommodate a person wearing glasses without any hassles. Even though there is a little bit of light leakage around the face, it is not a big issue. If you are a noob trying to get into FPV and need a cost effective option by not breaking the bank, then EV800D must definitely be on the top your list. Do check our review of the EV800D here. The Eachine EV100 are publicized to be a Fatshark FPV goggles killer at least in term of price. Built-in screens provide a resolution of 720x540. This goggles are avaragely sold by 1/3 of Fatshark models. Relatively new to the market these goggles promised a lot and actually have a really sharp image. Unfortunately, the screens are very small making them a tricky to recommend over the high-end box goggles. If you've got your heart set on a compact style goggle for what ever reason weather it be weight, optical reasons or even just appearance but have a limited budget Eachine have made a set of goggles for you! The screens are very small however the resolution is there as is a load of optional add ons you can get at a later date. Could you live with a 28" tv in your living room opposed to a 42"? If you're happy with that and the lack of diversity then these will work for you. The Aomway Commander is excellent value for the money, offering many features that are usually available only on some high-end goggles: OSD menu, diversity receiver, DVR, and power adapter. The only real FatShark Competitor out there for the time being. These goggles offer great screen with a great feature set and even diversity for a fantastic price. The only complaints would be the lack of a modular receiver option. These goggles have nearly every feature the FatSharks have an even include a great diversity receiver yet are far less expensive in total. They have received some great reviews with almost all pilots loving them. If you don't need to have the best of the best but are after a high end pair of goggles with a reasonable sized screen you cannot go wrong with these at this price point. If there was ever a goggle that came close to being a FatShark killer it would be these however for me personally as a 4:3 pilot they don't appeal as much as they might a 16:9 one. Loaded with features including a low-profile faceplate, DVR, and HDMI-in capability, the HD3 can accommodate a wide variety of analog and digital inputs to produce the finest, lowest latency image on the market. Goggles can be and probably should be the most expensive part of your FPV set up for one main reason. You cannot crash your goggles! (Well hopefully not!) The point is that you can build or buy a nice drone and then destroy it within minutes in a bad crash. Goggles on the other hand, if well cared for, can last for years. Now if you are on a tight budget but still want a decent performance there are many options available for you which I will cover shortly, however, if you are trying to decide which component to splash out on I would suggest these. If you later decide that you don't like the goggles or even the hobby a decent pair of goggles will have a great resale value! You may also wish to look at buying a second-hand pair from the start to save some more. Typical price ranges could be anywhere from $85-$500 dollars for a good set, however, cheaper options are available for as low as $40. RC Transmitter is also one of the core equipment in this hobbie. Along with Goggles you'll probably stick with your Tx for some time; so we suggest to thorugly research which one would best fit your needs. This category refers to all goggles that look similar to oversized sunglasses. FatShark was the first company to bring these to the mainstream market however companies such as Aomway and Eachine are starting to catch on and are becoming serious competitors. The main feature of these goggles is that it has two individual screens, one for each eye. By doing this they can use very small screens with cleverly designed optics that don't take up much space. From my personal experience I find this style goggle much more comfortable to use and somehow easier to focus on as they feel very connected to your eyes. Due to the light size they are also very easy to let sit on your forehead when you aren't flying. Look much better - If looks appearance matters to you! Whichever style of goggles you choose the resolution is going to play a huge part on how much detail you can see. As with any other device with a screen the higher the pixel count, the more you will be able to make out and hopefully, the better you will fly. You often hear FPV pilots complaining about hitting 'ghost branches' which are really branches that are just too small to be displayed on the goggles until they are so close a crash is inevitable. With this in mind, we really want to get as high as we can reasonably afford. Remember that our FPV cameras have a relatively low resolution compared to what we are used to in HD TVs, monitors and screens. Think back to the analog pre HD days so we don't need too high here. I would suggest 640x480 pixels as a minimum whilst going over the FatShark HDs 800x600 resolution being a little bit overkill. True HD systems such as the Connex Prosight HD are available however I would recommend waiting a few years until HD links are cheaper and more mainstream. This image although not FPV related makes a great example of how a lower resolution effects or perception. In the first image we can barely tell if it’s a man or woman, second we can't tell if they are happy or sad and finally, we see that they have a hand full of cash! Try and transfer that to obstacles you are flying towards at high speed to appreciate why a high resolution is important for FPV. Just like TVs, we can get goggles in either a 4:3 or a 16:9 widescreen format. As with most things the best option is a subjective decision and best for you to decide. The one thing you should do is always match your goggles with the correct camera aspect ratio to avoid any cases of stretching, squashing or cropping the image. When making your decision take a look at what kind of parts are readily available and what current prices are like. I personally prefer 4:3 as I do a lot of flips and dives and want to see as much as possible in the vertical directions. If you intend to use your goggles with a HDMI for watching films or playing games a 16:9 option might work better for you. Imagine watching the latest blockbuster film in an Imax theatre compared with on your phone... The difference in immersion is huge and is exactly the reason large FOV goggles such as the FatShark Dominator HD series are so popular. 25° - Looking at a standard size computer monitor a few feet away. Although many pilots prefer a larger field of view you can go too big! A massive display requires yours eyes to move around to take in the entire display. This could cause you to lose focus when looking at something such an OSD, I would not recommend going higher than 50 degrees if you intend to race. IPD refers to the distance between the center of your eyes which will vary from person to person and is important to get right when using compact goggles with a screen for each eye. Fortunately, most FPV goggles now feature some form of IPD sliders on the bottom that allow you to move the screens to suit your face perfectly. Many of us are not lucky enough to enjoy 20/20 vision and may need some help in the form of glasses or contact lenses to help us see clearly. This is a big factor that should be taken into account when buying goggles! If you wear contacts you will absolutely fine with any option and not have to worry either way however if you wear glasses things are a little more complicated. Most box style goggles are actually possible to use with glasses as most designs have space to fit them inside, shortsighted users may not even need them! Compact style goggles on the other hand do not have the space fit anything between your eyes and the displays which is why many offer diopter inserts. These diopters can slide in front of the lenses on the goggles and can be purchased to match many common prescriptions. 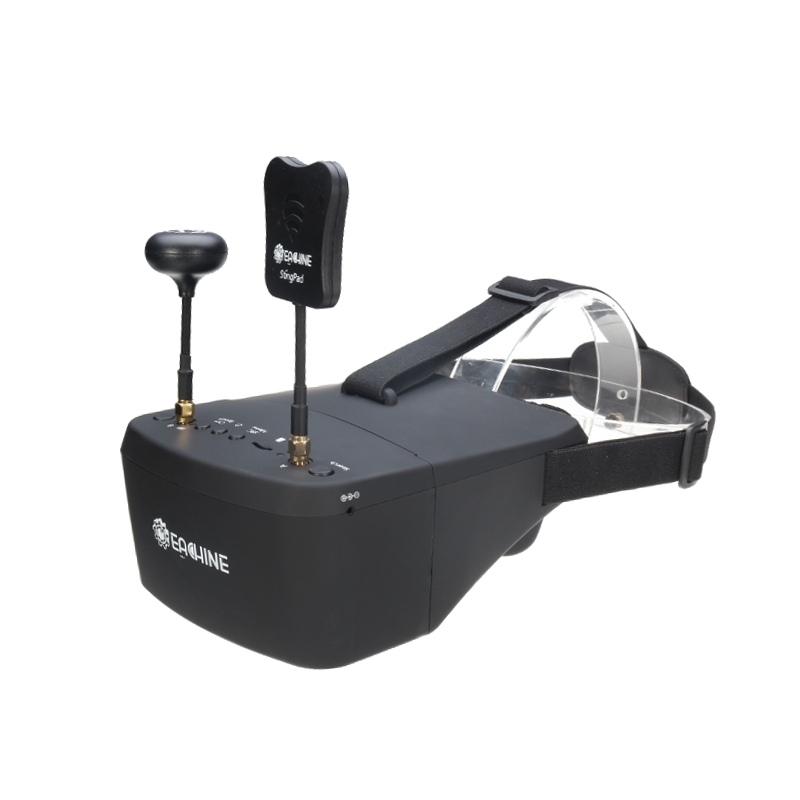 Newer goggles such as the Eachine VR100 have allow you to focus the screens by sliding them forwards and backwards. This works really well for mild prescriptions however it will only extend to a certain range with diopters not available. We've just covered the display features of the goggles however the part we haven't considered is the receiver. These come in two flavours, built into the goggles or as an additional module which you will need in order to tap into your FPV feed. Built-in receivers are normally pretty basic giving you basic functionality select a channel and view it. They normally offer reasonable performance and are a great option if you want to save some money and don't want to push the boundaries of RF performance and features. The only downside with a built-in receiver is that you won't be able to upgrade them in the future and you will need to shell out for a brand new pair of goggles should you ever want the extra features. External modules (typically only available for FatShark goggles currently) will push into the module slot on your goggles and can be used to greatly improve their features. Modules range from a basic single receiver to diversity setups with OLED displays and spectrum analyzers. These are great if you fly with larger groups and either want to watch them or find the clearest channel. The diversity setups also allow for the best possible video and range which will be discussed later in this article. Examples of top end modules include the La Forge and Furious True-D.
You may have heard people referencing their video channel as something similar to E8 or R4. These are just different names for different frequencies in the 5.8GHz area. So E8 = 5866GHz and R4 = 5769GHz the bands and channel numbers simply give us an easier way to tune into specific frequencies rather than tuning into an exact number. This diagram shows the bands as rows eg: FatShark, E, B, A and Raceband with the numbered sections showing the individual channel you would tune in to per band in MHz. That aside the most important thing to do is to make sure that the receiver in your goggles is able to tune into your drones video channel! As long as both are capable of the same bands you should be fine, if you intend to fly with more pilots you can use this diagram to select channels as far apart as possible to prevent against interference. Ideally, I would recommend keeping 100MHz between each channel however you can push it down to 50MHz with a clean set up. Note: Not all video transmitters are created equally! Despite some being capable of running certain channels they can be broadcasting across a much higher range than a high-end part increasing the chance of interference between channels. This is why some races actually specify a specific well know transmitter that must be used by all pilots. Please also be aware that some channels and powers may not be legal in some countries. You should look into this before purchasing your transmitter. Diversity is a feature that is actually made up of two receivers running separate antennas. When running the diversity clever software compares the two video signals and automatically switches to the strongest to always ensure the best performance. We will cover antennas in more depth in a sperate article however in diversity's case we can two completely different antennas and gain the benefits of both without drawback. A good example would be running a circular polarized antenna which works well all around you with a patch antenna that gives fantastic range but only in one direction. A DVR (Digital Video Recorder) is a circuit board inside your goggles that takes your analogue video input and writes it to a digital movie format that you can view on your computer and upload online. This is fantastic for anybody who doesn't have any kind of recording camera on the drone itself either saving you money or giving the lightest of FPV drones the ability to record their flights. Of course, the quality of the DVR will not be similar to a HD camera and it will be subject to any interference you would normally see through the goggles. It can however be very useful in the event you crash your drone and cannot find it. Most goggles allow you to play the DVR back to try and work out exactly where you crashed. Even if you end up loosing the drone, at least you will have some kind of footage of what happened. Typically a HDMI is found on a TV and is not that useful for FPV flying itself. It is however useful if you like the idea of using your goggles to play games, watch films or better yet fly some of the FPV simulators more immersively. Digital HD FPV will be coming in the future and getting goggles with a HDMI port is a great way to futureproof your investment. You can already connect it to Connex Prosight HDs and if you fly a DJI Phantom or Inspire you could also connect it up to your controller. This has always being a bit of an odd one to have included in FPV goggles however for some people its applications could be huge. The head tracker in your goggles uses an accelerometer and gyroscope to record where you are looking and send signals back to your remote. Those signal can be used to control a gimbal system on the drone that moves the camera as you move your head in a similar way to VR goggles. Most racing drones however crash far too often to warrant an expensive and delicate gimbal system whereas most photography drones need gimbals that can stay perfectly still and hence wouldn't be controlled by a humans head. The only place I have seen these being used effectively is on a fixed wing plane used for long range, exploration flights where the pilot has time to take in their surroundings. Perhaps in the future this feature will find more uses as people start flying the 360 VR cameras. Some people (all be it very few) like to fly with audio. Although it might seem unpleasant to hear the constant noise of the motors at first it has it's benefits as you can sense how much power you are using and identify any potential issues. Audio can connect you more with your drone and many goggles can offer it via a headphone jack on the side. Of course, you need to make sure your drone will need to be fitted with a microphone and have an audio capable video transmitter. The small space between your eyes and goggles can get very foggy which can make the screens unclear and cause you to crash. This is even more likely to happen if you live in hot and humid conditions or just sweat a lot! Luckily most goggles now come with fans that will clear the fog relatively quickly. If you are going for compact goggles I would highly recommend getting some with a fan. Built-in battery - these are great because they are always with your goggles however are limited by pack size and cannot be quickly changed. The goggles lifespan will most likely be determined by the life of the battery. These can often be charged via a USB power bank if needed. External Lipo Battery - An external battery pack that is kept either on the goggle strap or in the pilots pocket. These work well but can be a hassle to plug in and charge. The smaller lipo packs do not last too long on many goggles. 18650 Batteries - 18650 Lithium Ion batteries are commonly used in e-cigarettes and have great capacity to size ratios. They can be discharged lower than their lithium polymer counter parts and can be used in a case to make a great goggle battery. They will need charging via a dedicated 18650 charger. With these five goggles in mind, lets start by comparing the biggest factor… The Price. Due to constant sales and fluctuations on price I've taken the price I could purchase them for today (November 2017) in USD. I would of gone with the RRPs however some of the goggles have never been sold for anything even close to that! Expect some price variations and hopefully reductions in the future. As you can see here the price of the HD3s is eight times that of the basic VR-007 Pros, that sounds crazy especially when the HD3s don’t even include a receiver, antenna or actual batteries. Perhaps the features we'll explore later on will justify the price! Again your budget might help you make your decision quicker than any other of the specs will. Straight away here you can see that the budget VR-007 resolution is significantly lower than any of the other competitors. Every other goggle however doesn't appear to vary that much resolution wise, they do however vary in field of view where the budget compact Eachine VR100s are drastically lower than the HD3s. Notice that the HD3s are the only goggle here that has a 4:3 aspect ratio, the thought of stretching or squashing your camera picture depending on your choice may influence your decision here. Here we can see that the VR-D2s have nearly four times the resolution of the VR-007s but are only about a third more expensive. If your looking at a box goggles I'd have to recommend them for that alone! This really shows why the Fat Sharks are still the best FPV goggle available and is possibly the best way to justify the price tag. I would say that in real life the difference between the Eachines and Aomways is much greater than it appears here and would question exactly how the manufacturers are specifying FOV. I've read reviews that say the Eachines have a 25° field of view which sounds more accurate. It's worth mentioning that it is very difficult to compare the box goggles screen size against the compact goggles fields of view so please bare that in mind when drawing comparisons. Typically box goggles have a greater field of view than even the Fat Sharks. ** With the Fat Sharks modular receiver any feature here is possible depending on what you want to buy. As I mentioned before, if you have a built-in receiver you are stuck with it. Looking at the specs in this table that instantly shows an issue with the VR-007 Pros and the EV100s. The lack of diversity limits the range and clarity of the video meaning that I would not be able to recommend these to people who intend to fly at longer ranges (+500m). The receiver in the both VR-D2s are pretty good and it's nice to see a set of antennas included with each one. We then come on to the Fat Sharks which with no receiver are hard to compare, you can basically get all of these features with ultra clear reception and even an OLED screen if you want to spend an extra £80 on it, there are also some more basic £20 options. As expected the more you pay the more features you get. The top end compact goggles include every major feature with the cheaper Eachine EV100s even ready for modular upgrades in the future. The box goggles here come with a lot less features however it's really nice to see a DVR in the VR-D2 pros. Battery wise it's interesting to see that the higher end goggles don't actually come with batteries, the only advantage to this is that you can use third party or existing high capacity packs to suit your requirements. The three cheaper goggles all include decent batteries which is great for anyone on a budget. A quick note on using screens! Some of you may be considering using a screen to fly especially due to the ease that you can switch between LOS (line of sight) and FPV (First Person View) flying. For anyone looking to fly a racing drone my advice would be that unless you have any physical reasons or limitations why you can't use goggles, you should always go ahead and make use of them. The reason for this is that a screen is not only smaller but is also hard to see in bright sunlight and even can move around in relation to your eyes. They also don't get your full attention allowing you to be distracted by anything around you. Goggles, on the other hand, will put a big clear image in front of your eyes at all times which is consistent and easy to focus on. I've have yet to find anybody whose flying hasn't drastically improved once they've made the switch to goggles. Hopefully by now you are aware of all possible features goggles can offer and can start making decisions on best fpv goggles fitting your needs and budget. The goggles I have shown are just a small selection of what is currently available and you should be able to find a pair to meet your exact requirements. As with everything, nothing can beat trying the goggles out in real life and is by far the best way to make your decision. Look for local flying groups or head to local stores if you have them just to get a glimpse through as many goggles as you can. Hopefully you will naturally find something that works perfect for you.